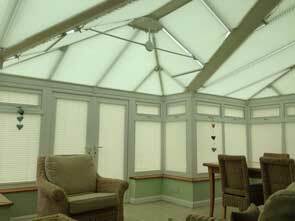 Pleated blinds are available as Freehanging, Rooflite rectangular, Rooflite shaped, Perfect Fit and Intu-design. This wide variety of options will nearly always ensure that there is a pleated blind which will be suitable for any type of window, door or conservatory roof. Some pleated fabrics are also available as vertical and roller fabrics so allowing vertical and roller side blinds to match pleated blinds. All the pleated blinds that we manufacture are automatically supplied with the unique Equipleat pleat retention system. The Equipleat system is a cord which has tiny plastic tags equally spaced along its length and this cord is passed through the fabric with a tag behind each pleat on the back of the fabric which then prevents the pleats from dropping due to the effect of gravity. The Equipleat system ensures that the pleats of the fabric are uniformly spaced along the length of the blind and more importantly it ensures that shaped blinds retain their shape. Perfect Fit is a stylish and versatile system of window blind, designed specifically for modern UPVC windows and doors. Perfect Fit enables tensioned pleated blinds to be installed perfectly onto modern UPVC doors and windows, including tilt & turn windows. The blind is fitted within an all round frame which is then fitted to the glass bead without the need for drilling any holes into the window frame. Intu-design pleated blinds are specifically designed for modern doors, windows and conservatories. We are able to manufacture 20mm freehanging and roof blinds to match the full range of fabrics offered for Iso-design pleated blinds.